☞ DATE & TIME: Thursday 7 February – Optional walking tour at 6pm, drinks and snacks available from 7pm at the cinema bar; screening at 8pm followed by a debate. ☞WALKING TOUR TICKETS: https://www.weezevent.com/lost-in-frenchlation-x-le-paris-noir-walking-tour LIMITED TICKETS AVAILABLE ONLINE ONLY – please reserve in advance to avoid disappointment! Amandine Gay’s feature directorial debut, OUVRIR LA VOIX (SPEAK UP) was born out of her desire to « occupy public space and to explain why the intersection of discriminations faced by black women in France is as problematic as it is political. » A celebration of the diversity of womanhood within the global African diaspora, Gay calls the film her response to the need for black francophone women to reclaim their narrative, and challenge the suppression of their voices, revealing the complexity and diversity of their lives and identities. Inspiring a conversation through intertwined narratives, SPEAK UP also exalts the history of black women’s resistance – those who’ve fought to be heard, and a testimony to those who will continue to fight into the future. 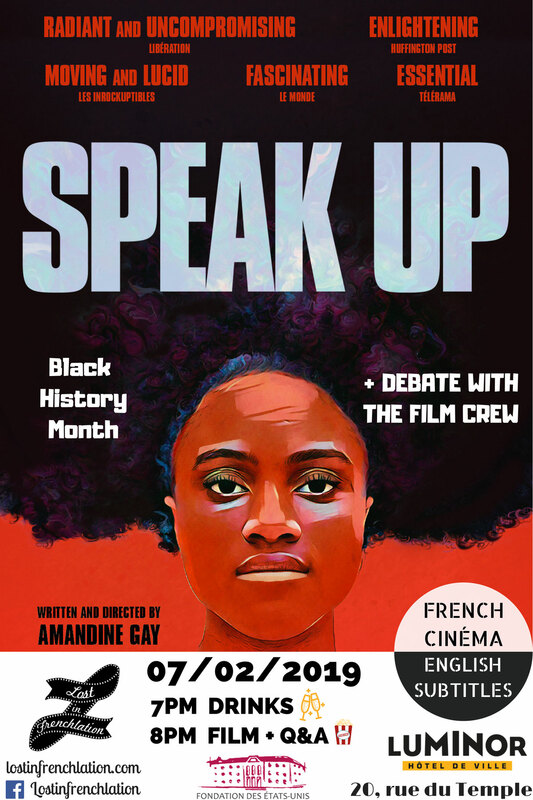 To celebrate Black History Month, Lost in Frenchlation and Fondation des États-Unis teamed up to bring it to you with English subtitles on Thursday 7 February, followed by a debate with the film crew. The screening will take place at cinéma Luminor Hôtel de Ville, located in the area of Le Marais, by Centre Pompidou. We will be offering a selection of Parisian drinks and snacks during our cocktail hour from 7pm. Then, at 8pm, the screening begins, followed by a Q&A with the producer, Enrico Bartolucci, and two members of the cast, Rebecca Chaillon and Nassria Abdoulhamidi! Tickets available both online and at the cinema. Don’t miss OUVRIR LA VOIX – A radically frank documentary about the experience of Black Women in France. Our screening begins on Thursday, February 7th at Luminor. Optional ‘Le Paris Noir’ walking tour at 6pm, drinks at 7pm, screening at 8pm, followed by a debate. 🎬The Lost in Frenchlation Team, in parntership with Fondation des États-Unis and Le Paris Noir.